Hooray for us! FactCheck.org again has been awarded the Webby for best Political Blog/Website. The announcement was made April 26 by the International Academy of Digital Arts and Sciences. This is the third consecutive year that we’ve won the judge’s award in the politics category, and it’s the seventh time since 2008 that we’ve been recognized by the judging panel. And that’s not all. 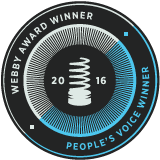 Thanks to the many readers who voted for us, FactCheck.org is also the recipient of this year’s People’s Voice Webby in the same category. We are now a nine-time winner of the award as voted by the public. The other contenders for best Political Blog/Website were The Nation, Bloomberg Politics, The Eastern Congo by the Council on Foreign Relations, and past winner Truthdig. The 20th annual Webby competition, which honors the best of the Internet, received nearly 13,000 entries from almost all 50 U.S. states and 65 countries, making it the “biggest in our history,” according to the IADAS. All winners will be honored at a ceremony on May 16 in New York City. The event will be available for viewing online the following day.